Get answers to some of the most common Chem-Dry questions we get. 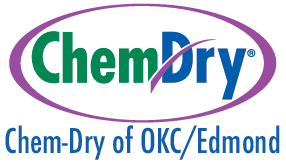 Does Chem-Dry of OKC/Edmond offer coupons, specials or promo codes for carpet cleaning? Is Chem-Dry of OKC/Edmond a steam cleaning service? No, Chem-Dry of OKC/Edmond is not a steam cleaner. We use carbonation to lift up dirt and grime from your carpets so we do not need to use the gallons of water that typical steam cleaners use. Continue on to the next question below to see how Chem-Dry compares to steam cleaning. On the other hand, Chem-Dry of OKC/Edmond’s process is very different. We need only a fraction of the water that typical steam cleaners use and instead rely on millions of microscopic bubbles to explode dirt from deep in your carpet fibers. We can then quite easily extract the dirt and moisture from the carpet. Not with Chem-Dry of OKC/Edmond. Many carpet cleaners including steam cleaners use soaps and detergents in their process. These soaps leave behind sticky residue that attracts dirt, leading to carpets re-soiling quickly after JUST being cleaned and often requires more frequent professional cleanings. At Chem-Dry of OKC/Edmond, we use a natural, biodegradable carpet and upholstery cleaning solution that doesn’t contain any soaps, detergents or harsh chemicals, so it won’t leave any sticky or dirt-attracting residue.